The first AWACS aircraft were EC-121 Constellations and they provided sterling service using the technology of the day. They were used with some effectiveness during the Vietnam war as they operated out over the South China Sea. As things improved it was seen that more up to date aircraft was needed for Air Force use. The Navy had used E-1's then the E-2 for their purposes, the latter having a revolving 'rotodome' for the radar in place of the somewhat fixed mounts used in the earlier aircraft. The USAF had to have one of those as well. Since these would be land based, a larger airframe could be chosen and the B,707/C-135 airframe was picked for this purpose. Given more modern TF-33 turbofans in place of the J-57 turbojets, the E-3A was borne. It has since been upgraded to E-3C standards, but the basic airframe is the same. Several are under NATO control and operated with Luxembourg call signs. France and the UK have opted for similar aircraft powered by much larger CFM 76 turbofan engines. 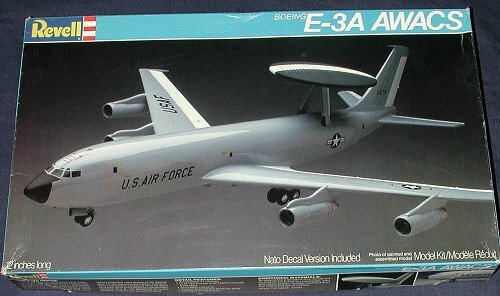 I'd not be surprised if the E-3 fleet were not similarly upgraded in the near future. 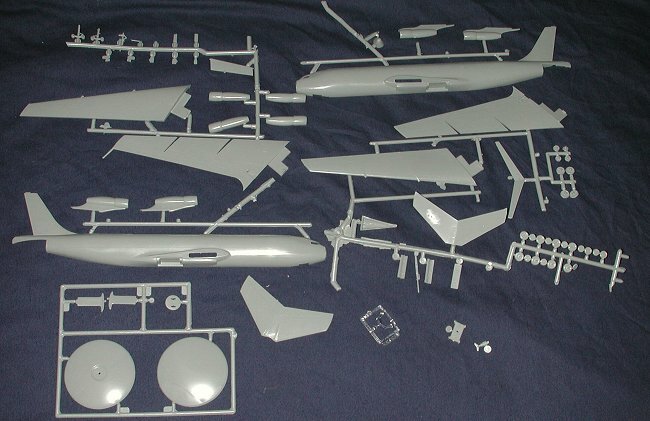 The Revell kit is really just a modification of its older box scale KC-135 kit. The kit is definitely of the raised panel line and rivet generation and the rather haphazard layout of the sprues gives evidence of this. There is no cockpit at all and wheel well detail is non-existent. Landing gear are also a bit on the clunky side, but since this is such a small scale, these things are not really that big a deal. Most of the parts have some flash on them, but considering the age of the molds, it is really minimal. The exception being the rotodome assembly, which is, of course, the newest of the sprues for this kit. A tail stand is provided as no nose weight info is provided. Naturally, it is not a problem to just start chucking in weights as there is tons of room for whatever you want to put in. The actual scale is 1/139 ; close enough to 1/144 for most of us. Several readers have commented on this kit and here is some info as to its true background: "Essentially the kit is a 707-100. Mods have been done to the mold over time, but it's still what it is. The fuselage is not right for a KC-135, a separate fuse was made for that. The words, "KC-135" or "Passenger 707" are visible inside the fuse to distinguish one from the other." The instructions are the standard pictorial diagram with colors given in generic terms. The 18 construction steps are well done and should provide no problems. Decals are provided for two aircraft. Both are in grey with white control surfaces. I'm not sure just what shade this grey is, but I'd use ADC grey as it seems the most likely. 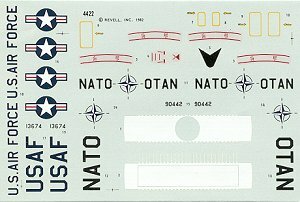 Markings are for a generic USAF version and for one of the NATO operated aircraft. From my limited experience with AWACS aircraft, about the only color that they have carried has been a colored tail band. There was one very pretty boss bird for the 552nd Wing, but I seriously doubt if you'll ever find aftermarket decals for this plane. The kit decals are well printed and appear to be very nice. The only other possible source of an E-3 would be the very large Airfix/Heller version and I think those are the CFM 76 powered planes. This one will fit on your shelves and though it is old, it still makes into a nice model. Kit courtesy of your editor. If you would like your product reviewed fairly and fairly quickly by a site that has over 250,000 visitors a month, please contact me or see other details in the Note to Contributors.